Might I suggest that trifle become your new go-to summer dessert? I know Jessica is whipping up any number of beauties, but sometimes what you really need is a dessert that takes full advantage of the season and minimizes oven usage. Had I also made a trip to Crate & Barrel I might have picked up a trifle bowl that properly shows off this concoction’s many layers. But let’s be honest, the minute you stick a spoon in it, any pretense at being neat is ruined so I wouldn’t fuss too much about the vessel. Just use a really big bowl and have at it. Blitz in blender until smooth. Strain out seeds if desired (but if you’re adding raspberries to the trifle, really, what is the point?). 1. Heat 2 c. milk with 3 T. sugar until boiling, whisking occasionally to ensure the sugar dissolves. Remove from heat. 2. While milk is heating, whisk 3 T. sugar with the egg yolks until visibly lighter. Whisk in reserved 1/4 c. of milk. Whisk in cornstarch and salt. Continue whisking until no longer lumpy. 3. Slowly pour roughly 1/4-1/3 of the hot milk into the egg yolks, whisking continuously. Add a bit more for luck. 4. Put the milk back on the stove, then slowly pour the yolk mixture into the pot, whisking continuously. 5. Whisk continuously over medium heat until the pudding thickens and a few bubbles break the surface. Rejoice and remove from heat. 6. Add butter and vanilla and continue whisking. Taste (but be careful, it’s really hot) and add more vanilla if necessary. If it’s lumpy you can either a) continue whisking if it’s just the cornstarch or b) strain it if you overcooked the eggs or c) blitz it in the blender to resolve either problem (Dorie’s recommended method). 7. Press plastic wrap to surface to prevent skin from forming, cool, then chill until ready to use. 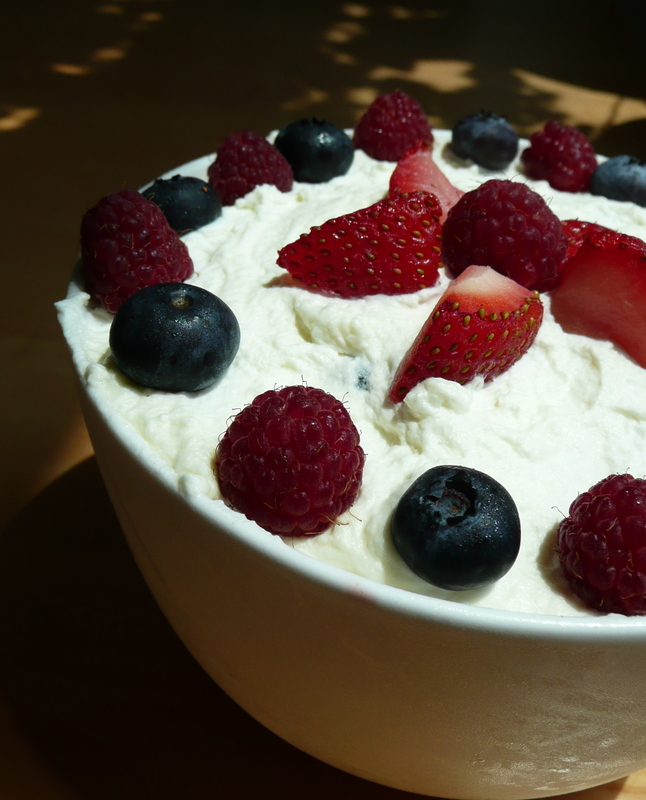 Whipping cream – do you really need me to explain this? Just don’t use canned stuff and add some sugar and vanilla. Probably benefits from being whipped to the stiffer side of acceptable (in case you were wondering what acceptable looks like, apparently it’s “billowy” – you’re welcome). Cake – I save all the bits from when I level cakes, or I just bake a few extra layers and stash them in the freezer for emergency trifle making. Most kinds of cake would be appropriate but for summer you should probably stick with the basics (vanilla or chocolate), after all, this dessert really should showcase whatever fresh fruit you’ve procured. Check Smitten Kitchen for some great cake recipes. Fruit – I tend to use a mix of berries, but am unopposed to the inclusion of diced peaches or nectarines, or really, whatever strikes your fancy. Go wild. You’ll probably need 6 cups of prepared fruit at least, but it depends how much trifle you’re making. I say go big or go home. You’d be amazed how fast it goes. Take a large bowl and layer as follows: cake (either rounds or bits depending on original material and vessel), raspberry sauce, pudding, fruit, whipping cream. Repeat until you hit the top or run out. Fudge it so you can finish the top with a slathering of cream. If that means you repeat an extra layer of pudding or something, well, life is hard. Chill, covered with plastic wrap, until ready to serve. Trifle benefits from a few hours of sitting, but I wouldn’t serve it to guests you don’t know very well past the first day. Of course, you’ll have to fight everyone else off. This never lasts past day 2 in my house. Enjoy! WARNING: Cake sogginess varies depending on the thickness of your sauce (I always go super thick – just let the frozen raspberries melt instead of being tempted to add extra liquid to encourage blending) and cake type (which is why I use regular cake instead of sponge – sponge is over-rated). I particularly like the reference to your mother and milk in the same sentence – 2 important essentials in life…. I was right your mother made her trifle with chocolate cake, Tim and I are going to make one with white cake….